AcuHand is a state of the art electronic system that gives the user measurable control over the angular positioning or the hand held instrument. In a time when technology has made dramatic progress in almost every aspect of our lives, the success of dental treatment still depends on the dentist's hand-eye coordination. The human hand is not a precision instrument compared to industrial machinery. It has natural limitations not only to control the movement, but also even to hold an instrument in a steady position. Our biological limitations of visual perception and of manual dexterity do not allow reliable control over the proper angular positioning of an instrument. That’s why AHS is designed to allow dental practitioners, who already have a high level of manual dexterity, to achieve nearly robotic precision. The AcuHand Systems consists of four integral components. A small sensor, which attaches to the handpiece, a computer preinstalled with AcuHand, dedicated software, and a foot pedal. The small sensor is attached to the base of the handpiece. The sensor relays information to the computer and the software then monitors the operator’s desired position for the handpiece. Once the operator places the handpiece in the desired position, the operator simply presses down on the foot pedal to lock in that position. The sensor then registers the slightest deviation from the preset parameters along three axes of movement. AcuHand allows to preset parameters of a work area (i.e. position, taper, allowable displacement, etc.) and will signal the operator when these parameters are compromised during tooth preparation or bone drilling. AcuHand aids in maintaining a predetermined angular position. In a clinical situation, the human eye cannot detect the difference in taper between 1o and 10o. 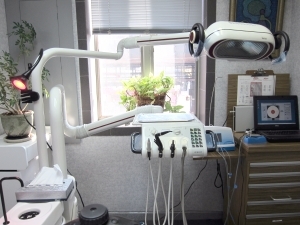 However, the AcuHand sensor attached to the handpiece and connected to the computer registers even the slightest deviation from preset position. AcuHand has adjustable sensitivity control. The operator has the freedom to establish the degree to which AcuHand will tolerate the displacement of the instrument. For example, when the operator chooses to make a tolerance for a maximum deviation of 1.5 degrees, when the bur has left the desired position by more than the preset maximum deviation, the AcuHand™ system will signal the operator. Once the operator returns to the desired angulation, the signal will stop. AcuHand software displays the actual degree of deviation beyond the desired position. 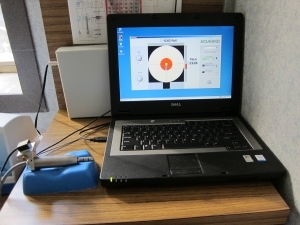 AcuHand™ displays the angulations of the handpiece on the computer monitor when the bur moves out of its starting position; thus, creating better control and measurements of deviation from the original position. AcuHand allows control of the instrument in any position from 0o to 360o. 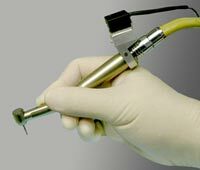 The AcuHand™ sensor that is attached to a handpiece is parallel to the bur. This allows the operator to move the handpiece 360o around the axis of the bur without causing a false signal as long as the bur does not leave the desired position.